Apart from using calottes or end bars to create and finish multistrand jewellery, using bead cone certainly opens up delightfully endless possibilities. You can use knots or French crimps (crimp beads) to secure your multistrands together and have it inserted into and hidden by the bead cone. French crimps would probably be more secure and that is what is shown in the steps below. 1) Decide how many strands you want for your design. 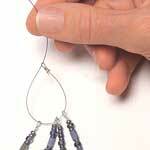 String the beads you want onto the beading wires. Check that the strands hang well togehter by holding them up with your hands. 2) French crimp each beaded strand, at both ends. 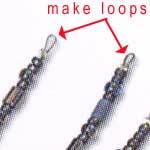 Make a small loop at each end (by folding the wire back through the crimp bead) before flattening and crimping the bead. 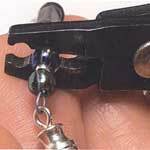 Thread the loose wire end into the beads to hide them. 3) Cut 2 lengths of beading wire. (The length of this will depend on how many more beads you intend to thread after the bead cone.) Make a loop at one end of these new wires using French crimps as you did before. 4) String your multistrands of beaded wires together using one of these new wires and and then thread it through its own loop to gather your multistrands together. 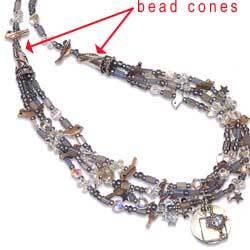 5) Thread this through one of your decorative bead cones. 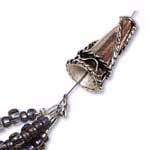 The cone should nicely cover the end of the strung-together beaded multistrands. 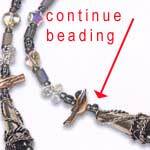 6) (optional) You can carry on stringing beads after the bead cone before applying your fastener. 7) When you are happy with the hang, look, and length of your jewellery item, end off with the fastener of your choice.